Here is a curiosity, which is a pity, as players of early music instruments do happen to live in the 21st century and can have some input into the contemporary scene. 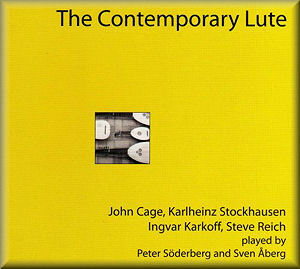 It is not restricted to Sting playing Dowland, and this marvellous collection by Peter Söderberg and Sven Åberg includes an arrangement of Stockhausen’s Tierkreis (Zodiac) from 1977, Ingvar Karkoff’s 4 duets (originally for 2 lutes), John Cage’s Dream and Steve Reich’s Piano Phase. Interestingly, most of the repertoire dates from the 1960s and 70s – what has happened to music in our century? In 1967, American composer Steve Reich wrote Piano Phase, a piece building on his experiments with the mechanical repetitions of the tape loop, but one that utilized live performance instead of an electronic machine. By adjusting the registration of two iterations of a single arpeggio, myriad new and unforeseen combinations are created. Piano Phase was a turning point in minimalism and arguably a critical juncture in contemporary music, transforming simple raw material into complex sounds via small shifts in the relationship of its parts (therein lies its connection with jazz). Swedish lutenists Peter Söderberg and Sven Åberg have adapted Piano Phase for two lutes. Theirs is a breathtaking, rarely performed and at times seemingly impossible version of Reich’s deceptively elemental and lovely composition. This entry was posted in Classical Guitar, Guitar and tagged Cage, lute, Reich, Stockhausen, Theorbos by Gerald. Bookmark the permalink.